The Q5 has a 2,180mAh battery, same size screen as the Q10 (but LCD instead of AMOLED) and a lower clocked chipset. How did it do? The talk time was a respectable 14 and half hours, well ahead of the 8 short hours provided by the Z10 but behind the 20 hours of the Q10. What’s the difference between Q5 and Q10 when the batteries are practically the same and the screen is off? Different modem that’s what – some Q10 models have CDMA connectivity so BlackBerry must have used a different modem. If your business has you checking the Web constantly, the BlackBerry Q5 doesn’t disappoint – it toppled the HTC One by just a few minutes and is now our reigning champ of web browsing with a bit over 10 hours. That’s over an hour better than what the Q10 (and its AMOLED screen) did. Whether a 3.1″ square is enough for web browsing is another matter. Finally, video playback – even execs have to unwind. 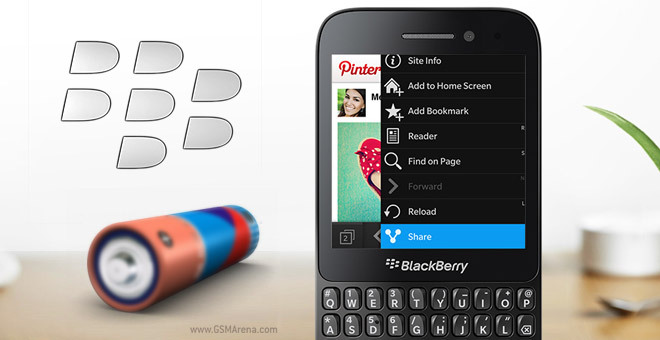 The BlackBerry Q5 added over an hour to the Q10′s time and is one of the best phones in this category. Again, watching even 4:3 videos will leave black bars, let alone what happens to 16:9 video. 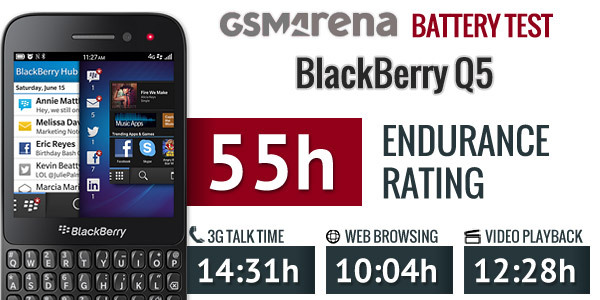 In the end, the lower talk time and not quite as efficient standby lead to an endurance rating of 55 hours for the BlackBerry Q5, an hour short of what the Q10 managed. You can read more about how we do battery tests here. In the end, 14 hours is more than a human being can manage in a single day, so the Q5 will handle all your business calls. If you do less talking, you can even browse the web for hours and you’d still have enough juice left when you come home.